Have had a rocky few days, but the weather at least continues to be kind – although windy, around here! I’ve finally been able to toddle up the garden and take some photos to update The Quest page. I’ve gone off that title and I’ve renamed it Country Living? for the moment, trying to find my starting point with it! Any helpful comments gladly received, it’s lovely to get comments! The thing is, we’re in a bit of a chicken and egg situation: our roses round the door country cottage in later years is now unlikely to happen – the unexpected downshift now means that we won’t pay off the mortgage or be able to save anything much before Himself retires. Ironically though, I will have more time to help get homestead tasks going, until I’m on top of the health situation, I don’t have what’s physically needed to get it all going! And without what I was earning, we won’t have a bean to do it all with! Still, living old-style now will give us good preparation for living old-style when we’r, er, old(er)! None of these factors are mutually exclusive and together present what is commonly known in optimistic circles as “‘a challenge” to make the home we now have into our retirement dream cottage. This is of course unless I write a successful novel or win the lottery – whichever comes soonest or is the most realistic – or is that, least fantastic, daydream? I guess that would be counting chickens there, to continue the chicken analogy! Of course I’m very aware of the fact that we are amazingly lucky- we do have a great house that can adapt into ‘dotage cottage’ along with us, and we will have huge fun rising to the challenge. The garden issue does remain a quest indeed, but where there’s a quest there’s a hero waiting to prove himself, so I guess Himself can be well cast into the hero role -not sure heroes hoik their trousers up under macho armpits before yomping off into the wilderness though! The Country Living? page will carry the updates of his quest to allotmentise the hard standing at the bottom of the garden, plus conquests of dragons and what nots! 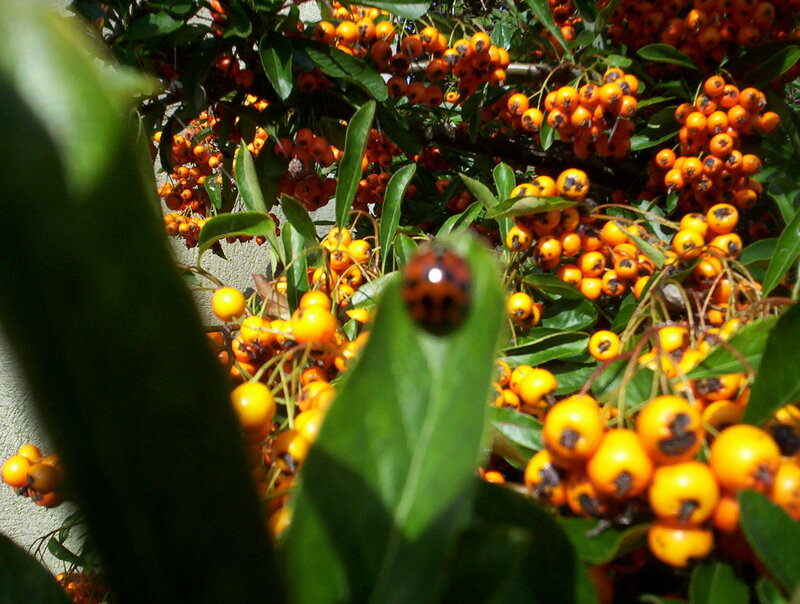 Meanwhile, enjoying the potent days of Autumn when the weather’s on-side, I found the spottiest ladybird ever. The pictures a bit rubbish – not sure if the camera was out of focus or me, but I love the colours and the spots! ← In the dog house! How about renaming The Quest ‘In Pursuit of the Good Life?’. A bit wordy, but just a little suggestion from me. I think the main thing with living this downshifting/good life ‘dream’ is that actually, at times, it’s a bit of a nightmare and bleedin’ hard work too. If anything, it teaches patience, frugality and a sense of achievement from seemingly banal or mundane things (at least, to other people – for instance, I’ll whoop with joy when I’ve finally mended the greenhouse and the other half has made the staging, because it makes such a lot of difference to me). There’s a lot of compromising too. I’ve learnt that – mostly from trying to run a house on a budget whilst I freelance and attempt to set myself on the road to the Good Life, and I don’t even register on the self-sufficiency spectrum yet.